My conclusion that, as a result of its interplay with Jupiter, Saturn exploded as a nova, I found confirmed in many ancient sources, in which Saturn is regularly associated with brilliant light...It is conceivable that the Earth was, at that time, a satellite of Saturn, afterwards possibly becoming a satellite of Jupiter. in addition the waters may have been rich in chlorine, an element which in combination with sodium forms common salt. Marine geologists are unable to trace the origin of the huge amounts of chlorine locked in the salt of the Earth’s oceans, the Earth’s own rocks being rather poor in this element and incapable of supplying it in the needed quantities. Chlorine may thus be of extraneous origin; being a very active element, it could possibly be present in some different combination on Saturn. I have searched for absorptions from the molecule HBr in the 4 μm spectra of Jupiter and Saturn and find upper limits to the mole fraction of HBr to beq(HBr) ≤ 1.6 ppb in Saturn andq(HBr) ≤ 3 ppb in Jupiter, or two and four times the solar abundance of bromine in Saturn and Jupiter, respectively. The upper limit for Saturn is lower than the global abundance of bromine, if, as expected, bromine is enriched in Saturn relative to C1 carbonaceous chondrites. This deficiency is most likely the result of local sinks for HBr. Less likely is a global depletion of bromine, conceivably related to the low condensation temperature of bromine-containing solids in the presolar nebula. Searches for HCl in the 4 μm window are also possible, but require large enrichments of Cl for detection with existing data. The quest to detect gaseous HCl, HBr, and HF in the atmospheres of Jupiter and Saturn has led to a tentative detection of 1 ppb HCl near Saturn's cloud deck. The detection is puzzling because, while these hydrogen halides may be present several scale heights below the clouds, they are expected to react with ammonia to form solid ammonium halide salts in the upper troposphere. I show that the loss timescale for condensation of gaseous hydrogen halides onto particles is ∼103–105 s for realistic cloud densities and particle sizes, which is much less than the ∼108 s residence time of upper tropospheric air. The hydrogen halides can only survive transport up to the cloud layer if less than 1 in 106 of their collisions with particle surfaces leads to condensation, which is unlikely. Even in the absence of foreign particles, homogeneous nucleation would probably prevent supersaturations in excess of a few hundred, which is ∼1020–1040 times too low to explain the observation. These calculations therefore suggest that hydrogen halides cannot exist at part-per-billion levels in the upper troposphere. The interplanetary source of halogens is also too low to produce detectable quantities of hydrogen halides except perhaps at pressures less than 1 mbar. A possible detection of chlorine by the Galileo probe at pressures exceeding 9 bars on Jupiter may be consistent with the equilibrium abundance of gaseous HCl or NH4Cl. Enceladus was discovered on August 28, 1789, by William Herschel, but little was known about it until the two Voyager spacecraft, Voyager 1 and Voyager 2, passed nearby in the early 1980s. In 2005, the Cassini spacecraft started multiple close flybys of Enceladus, revealing its surface and environment in greater detail. In particular, Cassini discovered water-rich plumes venting from the south polar region. Cryovolcanoes near the south pole shoot geyser-like jets of water vapor, molecular hydrogen, other volatiles, and solid material, including sodium chloride crystals and ice particles, into space, totaling about 200 kg (440 lb) per second. Over 100 geysers have been identified. Some of the water vapor falls back as "snow"; the rest escapes, and supplies most of the material making up Saturn's E ring. Scientists have been intensely curious about Europa since Galileo discovered it in 1610. In recent years, they’ve puzzled over the dark material coating the long, linear fractures on Europa’s observable surface. The material was associated with young terrain on this moon of Jupiter, suggesting that it had erupted from within Europa. However, the chemical composition of the dark material remained elusive, until now. If it’s just salt from the ocean below, that would be a simple and elegant solution for what the dark, mysterious material is. Europa is immersed radiation from Jupiter’s powerful magnetic field, causing high-powered electrons to slam into the moon’s surface. Hand and his team created a laboratory test that mimicked the conditions of Europa’s temperature, pressure, and radiation exposure. They tested a variety of samples including common salt – sodium chloride – and salt water in a vacuum chamber at Europa’s chilly surface temperature of minus 280 degrees Fahrenheit (minus 173 Celsius). They also bombarded the samples with an electron beam to imitate Jupiter’s influence. This work tells us the chemical signature of radiation-baked sodium chloride is a compelling match to spacecraft data for Europa’s mystery material. Two new studies hint at a richer picture of what’s happening on Saturn’s extraordinary icy moon Enceladus. At about 500 kilometers in diameter, Enceladus is a diminutive natural satellite. Cassini observations indicate the presence of more than just water in Enceladus’s geyser-like emissions. There appear to be sodium salts in E-ring material and hints of simple carbon compounds from flyby measurements of the geysers themselves. Now a new study by Glein, Baross, and Waite in the journal Geochimica et Cosmochimica Acta applies a detailed chemical model to the constraints of the Cassini data to ask what the internal body of water has to be like. The results suggest that it has to contain plenty of good old sodium chloride (table salt) and a big helping of sodium carbonate – akin to some of Earth’s chemically extreme environments like Mono Lake in California. This ‘soda ocean’ should be strongly alkali too – with a pH of 11 to 12. How does it get to be this way? If terrestrial oceans are a good proxy then these conditions suggest a process called serpentinization, where raw mantle material rich in iron and magnesium reacts with water. The scientists also point out a highly desirable side-effect of serpentinization – the production of molecular hydrogen which could serve as a potent energy source for analogs to Earth’s microbial fauna living in abyssal realms. Being a long time Velikovsky student (okay, ardent reader of his books anyway), I recently picked up a summary of his various astronomical predictions looked at since we have made considerable strides forward into the Solar System called "The Velikovsky Heresies" by Laird Scranton where he points out - with supporting evidence - that modern science cannot falsify any of Velikovsky's predictions. _The 2nd entry mentions chlorine on Jupiter's moon, Io. _The 4th entry says in "Louis Kervran's nuclear cookery book, salt (sodium chloride) has as its main ingredient- nitrogen! Both sodium and chlorine are formed in the correct one to one ratio by a series of low energy nuclear transformations, beginning with N2." _The 8th entry says chlorine is significant in Venus' clouds. _The 10th entry says chlorine has been discovered on Saturn. _The 17th entry says Velikovsky predicted chlorine will be found on the Moon where there was a brief ocean of salt water from Saturn. _The 29th entry says the Saturn Theory claims that the waters of the Great Flood came from a vortex between Earth and Mars and that it was sucked up from Earth to the vortex prior to that. _The 34th entry is similar to the 29th. I'll try to remember to include a link to this thread in my next weekly science articles list on the Resources board. By the way, in this post http://www.thunderbolts.info/forum/phpBB3/viewtopic.php?f=10&p=126176#p126176 I referenced a video that claims that the Sun goes nova every 12,000 years or more, but I said I think it was Saturn that went nova, not the Sun. The Saturn Theory says Venus, Mars and Earth were moons of Saturn, so the nova effects would have been greater than flares from the Sun. While it is interesting to me that the deuterium ratio of Saturn's rings matched the earth's oceans, it seems even more startling that the salt is present. Now I am going to read between the lines a little bit. Perhaps the reference to serpentization (in the article above) is in some way an acknowledgment by na sa of the high magnesium content of Saturn's water, and of the water plumes being emitted by Enceladus. And I also noted above that bromine has been measured in appreciable quantities around the gas giants. So in this, Velikovsky may have found a chemical match that exceeds all expectations! To me this means that it is possible that the oceans were deposited on the earth while it was a satellite of Saturn. -- unless the moon has chlorine also. Lloyd said, "...Velikovsky predicted chlorine will be found on the Moon where there was a brief ocean of salt water from Saturn." Is that from the VArchive? or elsewhere? Sure nick c, here are the references! I had no idea he had said anything about it, until the recent Space News presentation on the subject. I wanted to see the original statements. This thread has inspired me to revisit the writings of Velikovsky as I have not actually sat down and read any of his books from beginning to end in over 30 years. So I picked up "Earth In Upheaval" (1955) and am more than half way through. It is in my opinion V's most impressive work. It puts his mythical and historical "Worlds In Collision" within a "bones and stones" context, showing the physical evidence of recent catastrophes between the Earth and external cosmic agents. I would recommend that book for anyone who has not yet read it, or read it a long time ago and wants to revisit the subject. nick and nielwilkes -- I have decided to read that book too. I had only read The Peoples of the Sea, and even in that drier subject matter, he is a very clear and compelling writer. And, if the chemical association between Saturn's rings and our own sea water is as strong as it looks right now, I will hang Velikovsky's picture on my wall. (: And that is a very important act, from me, because I agree with Freud when he said of psychoanalysis, "They do not realize that we are bringing with us the plague." Last edited by Brigit Bara on Mon Jan 14, 2019 7:34 pm, edited 2 times in total. On a lighter note, maybe I will even thank Saturn when we put salt on our eggs, why not! It still needs to be shown why Enceledus' plumes are so important as a link to Saturn's composition, and not merely evidence of a hidden ocean beneath Enceladus' exterior. I wonder if Velikovsky might have even thought that the rings themselves were frozen remains from that original flare? Logic would suggest humans have made significant note (initially orally) of the sudden inability to drink from Oceans. So I would scratch the idea that the origins of Salt content within oceans was the result of a recent (within human memory) interaction. Millions of years of aquatic adaptations to Salt Content would throw a wrench in the idea it resulted virtually overnight via Saturn as well. 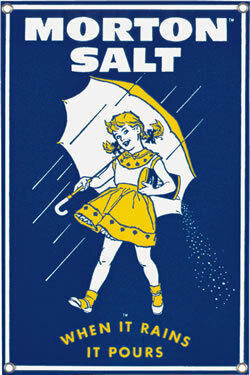 Mainstream; that salt is derived from the Earth and subsequently carried into oceans via Rivers holds water. Whats more interesting, is the possible Chemical component Chlorine may have played in the origins of FRESH water via Glaciation on earth. I've always found the thin concentric ring pattern of Ice sheets having formed, radiating out of what was then Earth's magnetic pole (note the absence of Glaciation in Siberia located well above Arctic Circle) to be much more plausible than the absurd requirements Milankovitch Cycle + Laurentide Ice Sheet need to fit. So if a Electrical (plasma) connection/interaction via Saturn was the result of Glaciation. How do we re-create the environment to produce Fresh Water? Would an Arc Mode plasma discharge boil off Salt if it made connection within Ocean? How much longer would a Glow Mode sustained discharge take to reproduce similar results? Both of which might suspend enormous amounts of water into the Atmosphere ... creating a continuous snowfall (The requirement of Glaciation) as far as >??? 1600kms in any direction. Could a closer inspection of Earth's glaciation provide an accurate interplay for Saturn's repeated visitations to Solar System before our current speciation?